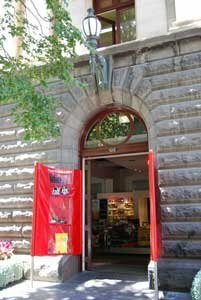 Don't forget to visit the City Gallery when you next pass Melbourne Town Hall. .......and most people I know haven't heard about it. .......It shares a space with a ticket office - just go in, turn left and you'll see the exhibition. It's small but that makes it a good place to be able to pop in and out in your lunch hour or before the kids start saying 'I'm bored!!'. You should be able to see most of the exhibitions within 10 or 15 minutes. 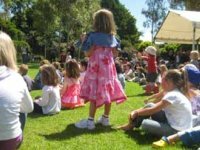 There are 4 exhibitions held every year using art owned by the City of Melbourne. The City apparently owns between 7000 and 8000 items depending on which website you read! The collection’s include regalia, lord mayoral portraits, Moomba things, 1956 Melbourne Olympics items, architectural drawings, city gifts, a wide range of historic photographs. There's also a growing contemporary art collection which focuses mainly on Melbourne themed art and works done by south-east Australian Indigenous artists. ........The exhibition I saw included a lot of old photos of Melbourne which were very interesting. ........Visitors were apparently asked to visit with an open mind but then were reminded to make sure they'd put enough money in the meter while they were in the exhibition!!! The Town Hall is located at 110 Swanston Street, Melbourne. It's open Mon 10am-2pm, Tues-Fri 11am-6pm, Sat 10am-4pm and closed Sundays. 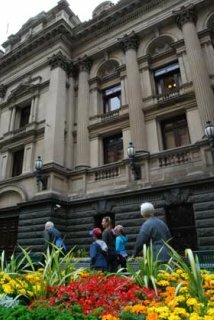 If you're making a plan to come specifically for the gallery and you're not just passing, then check out the Melbourne Town Hall page of this website and go on a free tour around the Town Hall at the same time. You do need to book this tour 24 hours in advance though. Check out the location of the Gallery in the map below.